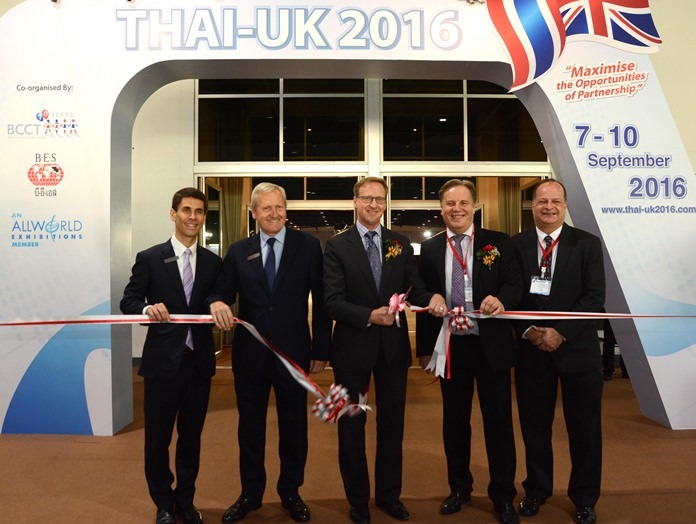 Thai-UK 2016 was a 4-day celebration of Thai-UK friendship and successful business partnership that took place from 7th to 10th September at the Bangkok International Trade and Exhibition Centre. Thai-UK 2016 also celebrated the 70th anniversary of the British Chamber of Commerce Thailand (BCCT). (L to R): Justin Pau, Bangkok Exhibition Services; Paul March, Overseas Exhibition Services; H.E. Brian Davidson, British Ambassador; Simon Matthews, BCCT Chairman; and Greg Watkins, BCCT Executive Director formally open the Thai-UK 2016 exhibition at BITEC. Thai-UK 2016 is the third such celebration. The first took place in 1996 at the Grand Hyatt Erawan Hotel and Amarin Plaza and coincided with the State Visit of Her Majesty Queen Elizabeth II to Thailand. 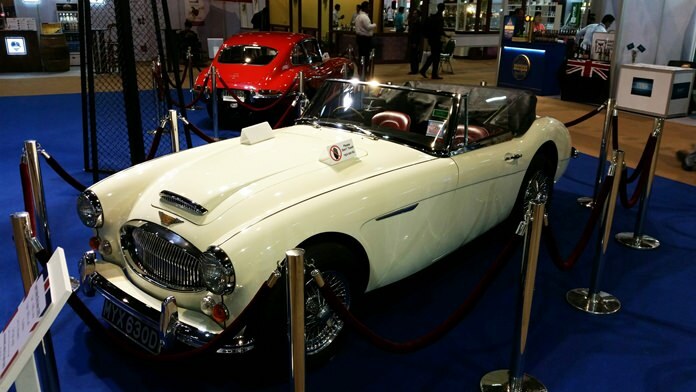 The second was the first collaboration with Bangkok Exhibition Services with co-location next to the well-established Food & Hotel exhibition at Queen Sirikit National Convention Centre in the heart of Bangkok. 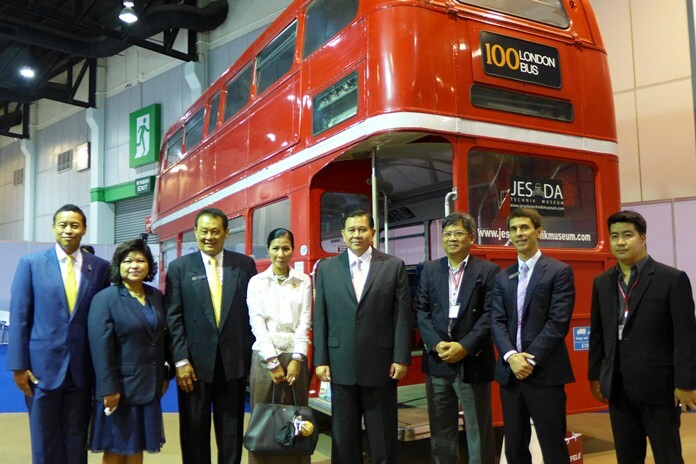 Deputy Prime Minister General Tanasak Patimapragorn (4th right) and Minister of Tourism & Sports Kobkarn Wattanavrangkul with delegation next to a genuine classic London Routemaster bus on display at Thai-UK 2016. There was a pictorial display, with dual language commentary, of the History of UK-Thai relations from the very first trade contact more than 400 years ago; the 1996 State Visit of HM Queen Elizabeth II to Thailand; and a BCCT’s first 70 years. Founded in 1946, BCCT is the oldest and one of the largest foreign chambers in Thailand. 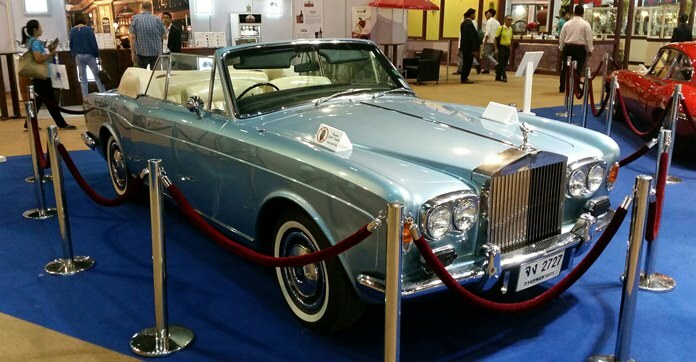 BCCT is also the oldest and largest British Chamber in Asia, in terms of corporate membership. Joanna Kearney, Director of Admissions & Marketing introduces Regents International School to H.E. 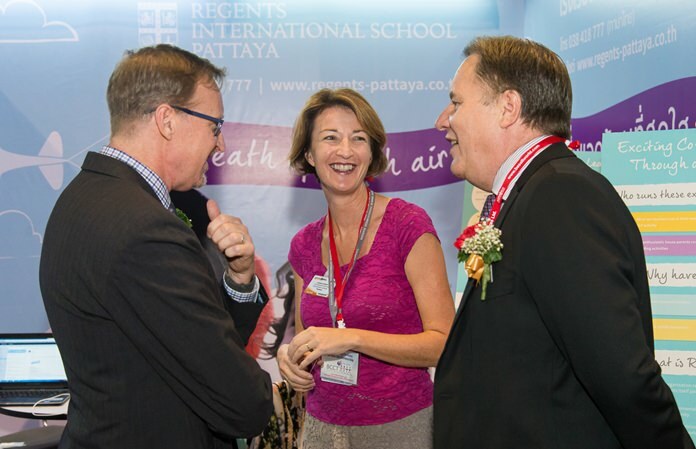 British Ambassador Brian Davidson (left) and British Chamber of Commerce Thailand Chairman Simon Matthews (right) at Thai-UK 2016. 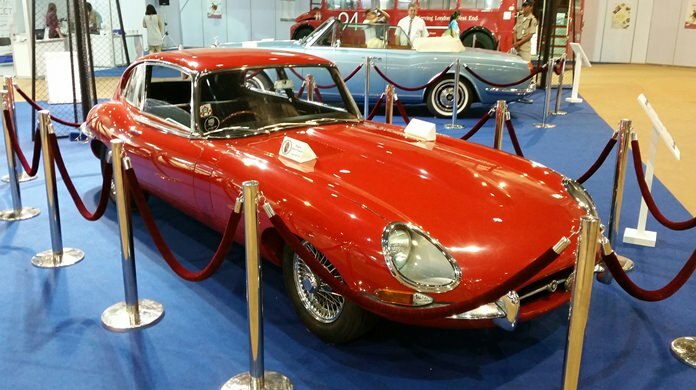 At its inception there were 20 founding British members including several companies represented at Thai-UK 2016. There are now more than 600 corporate members with close to 3,000 representatives. Just as the UK is an open trading economy, membership of the BCCT is open to companies of all nationalities and sizes. In 1996 BCCT organised 35 events. 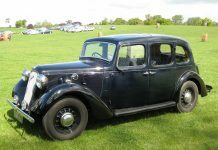 Last year a dedicated events team of three organised more than 130 events. Thai-UK 2016, The Life and Style Garden Party at the British Embassy, Taste of Britain 2016 with Tops, the Annual Christmas Luncheon and our new International Business Awards with Big Chilli are BCCT’s five major events this year. 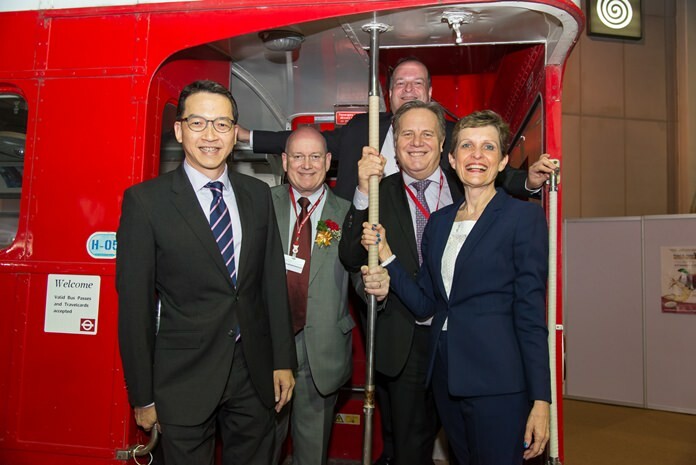 Kelvin Tan, Chief Executive Officer (2nd right) welcomes H.E. British Ambassador Brian Davidson to Thai-UK 2016. 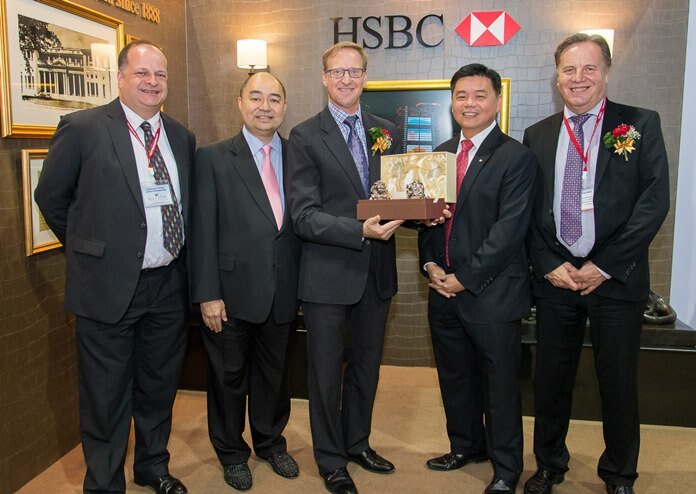 HSBC in Thailand initially opened for business in 1888 and was the first commercial bank in Thailand. Eastern Seaboard activity began with the formation of a sub-committee in October 1997 under the Chairmanship of Graham MacDonald. Nearly 20 years on, Graham, Jim Howard, David Nardone, Peter Malhotra and Greg Watkins regularly attend Eastern Seaboard events to this day. There are now monthly multi-chamber business networking evenings and occasional briefing sessions. Approximately 10% of BCCT membership is either based on the Eastern Seaboard or has significant business there. John Christie, CEO of Tesco Lotus (left) introduces H.E. 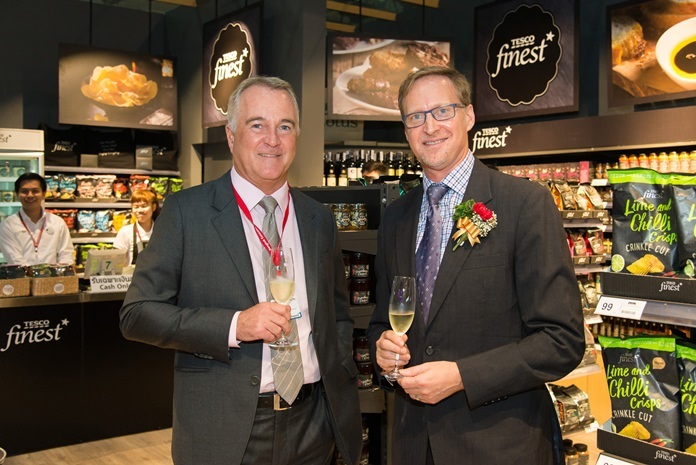 British Ambassador Brian Davidson to the Tesco Finest product range at Thai-UK 2016. Tesco Lotus is UK’s largest investor and employer in Thailand with more than 50,000 full-time staff in over 1,700 stores across Thailand. Durham Duplex ready for business at Thai-UK 2016. 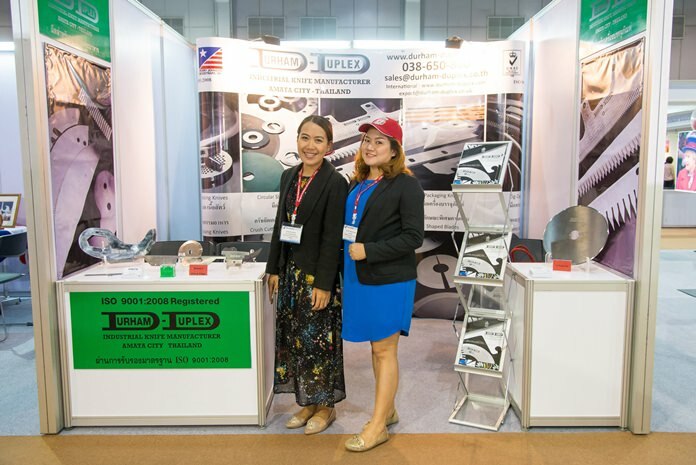 Transferring Sheffield’s great tradition of blade manufacture to Thailand, Durham Duplex (SEA) Limited’s factory was established in 2008 in the Free Zone of Amata City Industrial Estate, Rayong. 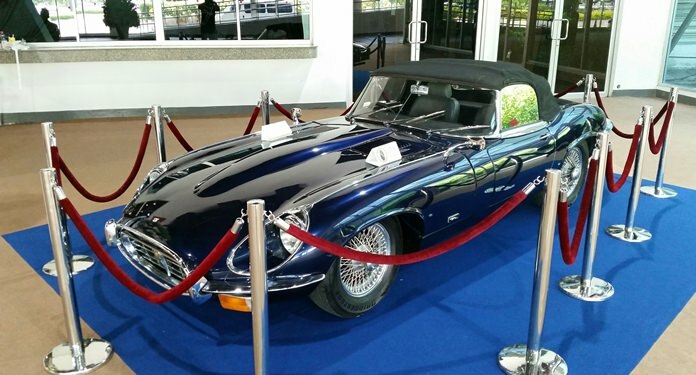 Jaguar/Land Rover took pride of place at the entrance of Thai-UK 2016. 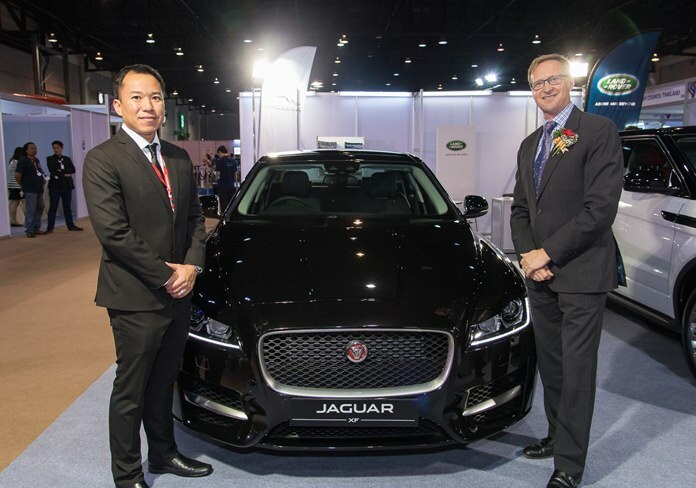 Managing Director Charnchai Mahantakun (left) introduces the latest models to H.E. British Ambassador Brian Davidson. 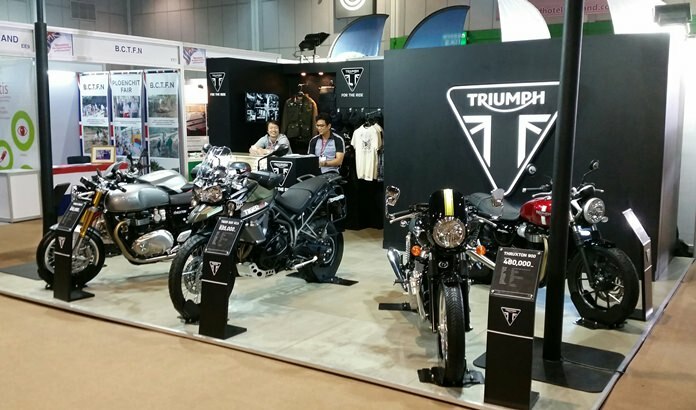 Triumph Motorcycles displayed five of their latest models at Thai-UK 2016. 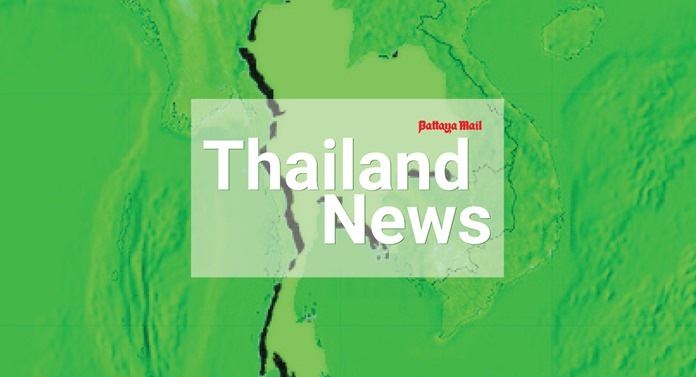 Triumph Motorcycles Ltd is the largest British motorcycle manufacturer with half of its six factories worldwide located on the Amata Nakorn Industrial Estate in Chonburi employing more than 1,000 staff. BCCT takes the bus. Hold tight shouts BCCT Chairman Simon Matthews (2nd right) with from left Boyd Chongphaisal of GSK, Graham MacDonald of Macallan Insurance Brokers, BCCT Executive Director Greg Watkins and Heather Suksem of PCS/OCS. 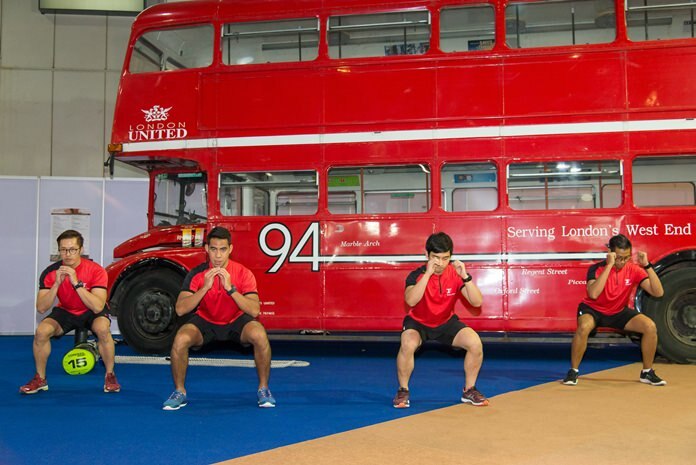 The Fitness First team inspire visitors to Thai-UK 2016 with an energetic routine in front of the London Routemaster bus. 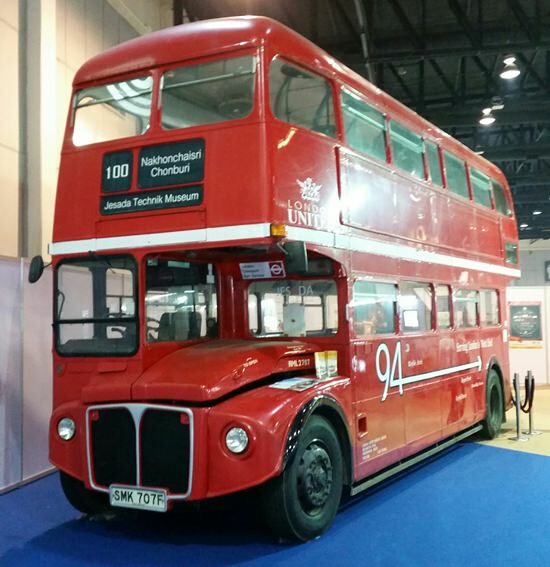 The classic London Routemaster bus is from Jesada Technik Museum in Nakhon Pathom. The first Routemasters entered service with London Transport in February 1956 and the last was built in 1968. They were withdrawn from regular service in December 2005. The number 94 at Thai-UK 2016 originally ran from Acton Green to Trafalgar Square. Previous articleIt’s not how fast it goes – it’s how fast it pulls up!